Every year at the end of the summer hubby and I go camping. The primary purpose of this fall camping trip is decompression and relaxation. The main activities for this camping trip are eating, drinking, sleeping, drinking, reading and drinking; all while enjoying the brisk air, the beauty of nature, and a roaring campfire. I was recently gifted a case of beer that exemplifies what our annual camping trip is all about. The slogan - Taste the great outdoors! The beer? 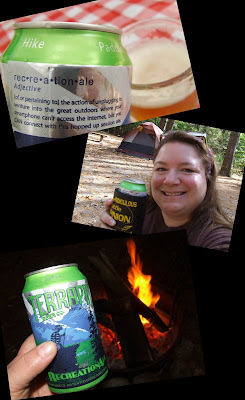 Recreation Ale by is a hippety hoppety hopped up American Pale Ale by Terrapin Beer Company. The alcohol content is a very sessionable 4.7% ABV, so you can safely drink a few and not get so fluffy that you fall into the fire. That's a good thing. It pours a hazy golden straw color with a big fuzzy head that leaves behind tight lacing all the way down the glass. The aroma is hops, hops and more hops. Mostly dank, earthy hops. An incredibly mouthwatering smell. The taste is wonderful bitter hops. All kinds of hoppy goodness - dank, nutty, earthy, pine, citrus - all competing for my tastebud's attention. There is the tasty addition of malty sweetness that comes through to balance out the bite and add complexity. Th finish is clean and bitter and makes your mouth beg for more. The mouthfeel is light and bubbly. The effervescence leaves behind a pleasant tingle. If I've managed to leave any doubt, let me state quite clearly that I love this beer. So good and refreshing and incredibly drinkable.